The Denver Occupy movement was supposed to show up at 5:00 for Freedomworks Blog Con in Denver. They actually showed up at 2:00 — smart, well — for socialists. About 15 scruffy looking protesters arrived in the lobby with, as far as I can tell, no intention other than disrupting the conference. They succeeded — but, not in the way they expected because after they started chanting, bloggers poured out of the conference to take pics and videos. Soon, there were 30 bloggers surrounding 15 Occupy people and chanting things like “We love Koch money” and “Breitbart, Breitbart!” There was lots of chanting, lots of yelling, and Steven Crowder got shoved by one of the female Occupiers. The police showed up maybe 15 minutes after the protesters started raising a ruckus and I managed to get this fantastic snap outside. 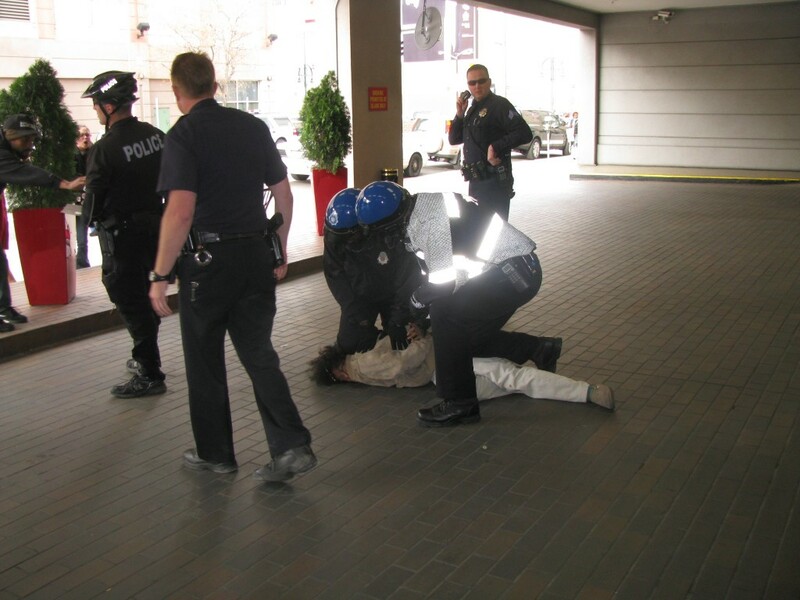 It was a tough situation for the police because the scruffy Occupy loons were screaming at them to let him go while the Blog Con people were walking out to take pictures and mock the Occupiers. Soon, the police dragged the Occupier and everything got to business…for the moment. Update #1: Here’s raw video footage from Sunshine State Sarah. Update #2: More info on the guy who was arrested. I was told that he crashed radio row earlier and that he tried to knock over a police officer’s bike and resisted arrest, which is why they had to pin him down like that. However, let me emphasize, that’s what I was told by other people who saw it, not what I witnessed personally. My buddy Javier from The Shark Tank got some great footage of the Occupier being hauled off to the back of a police car. He has a great pic over at his blog, too. Update #3: From Hot Air. Frankly, the BlogCon response overwhelmed whatever the protesters tried to say – with chants of “Mike check!” and “We paid for your student loans!”, among others, the Occupiers got roundly shouted down. At one point, the entire BlogCon contingent in the lobby started chanting, “We want the dog!”, a reference to the elected leader of Occupy Denver – a pooch named Shelby. I’m not sure what prompted the arrest. The police arrived, apparently at the request of the hotel, when the two sides began their loud clash. We have been informed that the hotel cannot keep the Occupiers out of the lobby, thanks to anti-discrimination law, but they can keep them out of our conference rooms – and hopefully the corridors of the hotel. Fortunately, access to the elevators depend on having a room key, so we’re probably safe enough. We’ll update the post as events transpire, but hopefully the Occupiers will satisfy themselves with protesting on the sidewalk, which is their right. Update #4: Occupy Denver came back and again, I don’t think it came off like they expected. There were more of them this time and it was outside the hotel instead of inside. They did their chants, bloggers came out, we mixed in. They chanted, we chanted, someone offered them soap and it was quasi-friendly as we started. Emily Zanotti and I even got a pic in the middle of the scrum. But, as they moved on, some chick shoved Steven Crowder and bellied up to him like she wanted to fight, which was perfectly ridiculous. Then there was a threat to kill him and a bunch of angry comments as they stormed off.